The whole of a motorcycle engine’s output is to rotate the chain and of course ultimately the rear wheel. That’s a lot of power and stress against a relatively small surface area of moving metals. Needless to say, under such pressure, the chain should always be kept in its very best condition. When you consider the components of a chain it’s easy to see how dirt, grime or rust can interfere with links and o-rings. Excessive build-up can lower performance and effectiveness. 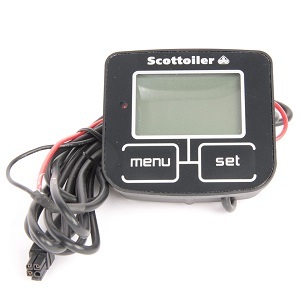 The Scottoiler V System applies lubricant to your chain automatically as you ride. This is a tried and tested system that is highly regarded by savvy bikers. Call me mad but I actually like cleaning a motorcycle chain (kind of!) It’s just that I prefer to see what’s going on down there. 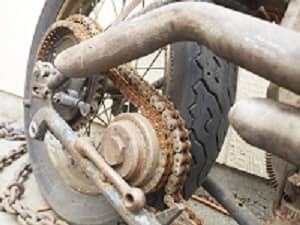 Therefore, I’d grab a small can of Kerosene and give the chain a good clean with the Bike It Chain Brush. A well-maintained, properly adjusted and lubricated motorcycle chain can last up to 30,000 miles. A neglected chain frequently subjected to rain can become problematic after only 3,000 miles. So how often should we clean and lubricate them? Chain care is a multi-stage affair. Chains accumulate gunk and grime. Very light coatings of rust may also appear after exposure to water. Firstly, spray the chain thoroughly with kerosene to dissolve the existing lubricant and flush out the dirt particles. After leaving for a while to soak in and take effect, it’s time to brush out any stubborn particles or rust. Stiff metal brushes may be too abrasive for some chains however a lighter brush or all-encasing ‘grunge’ brush should do the trick. Once you’ve given the chain a good brush out then reapply some kerosene to flush it all away. It’s the dirt and muck that really attacks the o-rings and shortens chain life. You might also want to check around the sprockets, especially the front one which may be hidden by a protective cover. Here is where excessive grime may accumulate. It may be time to lubricate your chain. 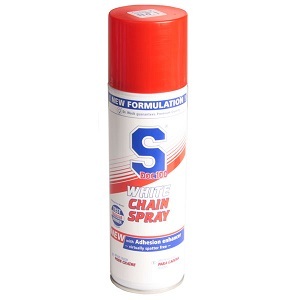 In order for the lubricant to be effective you need to dry off the chain after brushing and spraying of kerosene. 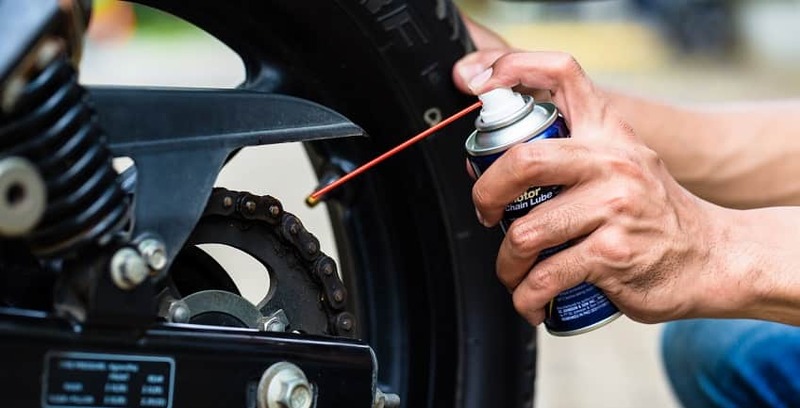 Chain lubricant is best applied with a spray tin by directing the thin nozzle tube onto the base of the rear sprocket where the liquid can drop onto the top of the chain and penetrate the parts. Both the outside surfaces of the chain should be sprayed directly even though the liquid is a little messier to apply here. Riding a bike to warm up the chain and allow the lubricant to sink in is arguable. It may work but avoid riding too soon in case too much liquid runs away before taking effect. Now you should have a dirt-free and well lubricated motorcycle chain. It has been claimed that fuel consumption and performance improves with a well maintained chain. No longer will you hear that dusty, grinding sound as you free-wheel or slow to a stop. Never run the engine with the rear wheel jacked up on the centre stand and spinning. This method of providing motion in order to clean a chain has cost a number of riders their fingers. It really doesn’t save much time and why take the chance? The Scottoiler vSystem begins with a small oil reservoir. It doesn’t have a pump but works off a vacuum once the engine is started. Gravity assists the flow of oil along the tubing to the delivery system mounted above the rear sprocket on your bike. Previous versions had a single delivery point but now a dual feeder adds oil to both sides of the sprocket giving a more even and complete coating. Topping up oil is simple. Just remove a small top cover, add the oil via a thin tube until full and then you’re ready to go again. Scottoil claim a range of 400-800 miles per reservoir or 2,500 miles per 250ml refill bottle. 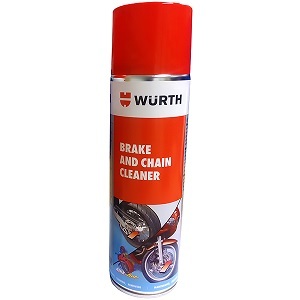 Wurth Brake and Chain Cleaner is a dual purpose cleaning spray for motorcycle brakes and chains. It washes away the dirt, grime and brake dust leaving no residue. The cleaning spray contains no CFC’s, hydrochloric acid or aromatics. Usually brake and chain cleaners are separate items but the Wurth cleaner works on discs, drums, calipers and all the links and components of a motorcycle chain. SDoc100 White Chain Spray may be the answer to cleaning wastage. It achieves this through its adhesive properties allowing it to remain on the chain’s surface longer than more runny alternatives. The spray has lubrication additives allowing greater penetration to all the links and components. The manufacturers claim a higher performance and longer chain life by up to double that of competing products. Cleaning the individual links of a motorcycle chain with a toothbrush is probably the more traditional method. However, it’s time-consuming and very tedious. 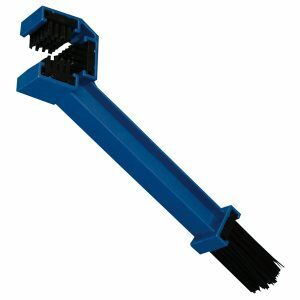 The Bike It Chain Brush has three sides to it and makes the job much easier. The exposed side can simply be reached by rotating the head or using the other end to brush out the dirt. It is best used in conjunction with a reliable chain cleaner or some kerosene. The Scottoiler eSystem works by delivering tiny drops of oil to the chain at pre-set intervals while the bike is in operation. 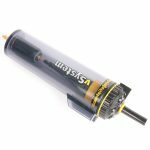 Installation is not a quick add-on but neither is it full-blown mechanical work. The full unit can be installed and ready to go in less than an hour. The digital display can be mounted up near the handlebars in a similar position to GPS devices. A cable runs to the small oil reservoir which is activated by a simple connection to the bike’s battery. Information shown includes oil levels, temperature and of course the all-important rate of flow which can be set by the rider. 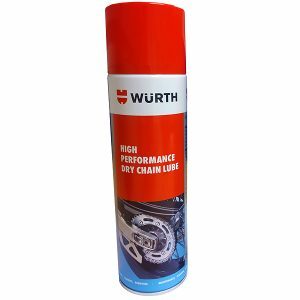 Wurth High Performance Dry Chain Lube is transparent and extremely adhesive compared to other types. Its protective properties reduce noise and extend chain life and with chains costing around £120 that’s not a bad thing. The application is rapid-drying leaving the surface with a tough and protected lubricated film causing no damage to O-rings. The spray also shields against water, acids, steam and corrosion. By reducing run-off the wax-based chain lube is able to reach and attack deep into the chain. It can be used with Wurth Brake and chain cleaner. We have seen that chain care and maintenance improves the safety, operation and life of your motorcycle chain. Scottoiler options reduce the use of sprays, brushes and cloths often prolonging chain life several times. They are an expensive but very effective method but the rider has to do their bit too by way of visual inspection, monitoring of fluid levels and correct installation of the unit. For those that prefer the more hands-on approach I hope the selection of products above featuring cleaning sprays, brushes and lubricants will give you peace of mind.